FRENCH GUIANA, or Guyane française, is the only one of the three Guianas (British, Dutch, and French) to retain its political links with Europe. Having been a full part of the French state as an overseas department since 1946—and thus a part of the EUROPEAN UNION— its citizens look to Europe more than to South America for cultural and economic identity. Indeed, the space center at Kourou, the primary launch site for the European Space Agency since 1964, accounts for about one-fourth of the area’s entire income. 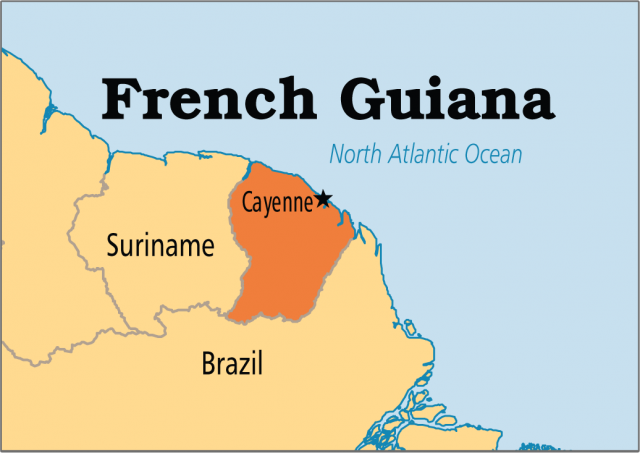 Though physically a part of the South American continent, for historical, economical, and cultural reasons, French Guiana, along with its neighbors SURINAME and GUYANA, is generally categorized as part of the Caribbean. French Guiana is the easternmost of the Guianas; it is also the smallest and the most sparsely settled. Its population of nearly 190,000 cluster along 234 mi (378 km) of coastline or along the country’s numerous rivers. The longest of these rivers, the Maroni, forms the western border with Suriname. The rivers emanate from a hilly interior that steadily climbs to the heights of the Tumuc Humac Mountains (the easternmost segment of the Guiana Highlands which stretch from here to VENEZUELA). These mountains, along with the river Oyapock, form the border with the Brazilian province of Amapá to the south and east. Further to the southeast lies the vast DELTA of the AMAZON RIVER, about 250 mi (400 km) away. The coast is highly affected by this proximity, and its swamps and coastal lowlands are continually replenished by organic material swept up the coast from the delta by the Guiana Current. Much of the economy of French Guiana depends on the abundant shrimp found in the river estuaries. The interior is still 90 percent forested and unsettled, and though full of valuable hardwoods and gold, it remains largely unexploited because of unmanageable distances and high costs of transport to the coasts for shipping. The French were the first to settle in the region, in 1604 (even before they settled in CANADA), but the coastal settlements changed hands with the English and Dutch before settling on the present divisions in the early 19th century. Early settlers grew tobacco and cotton and obtained dyes and woods from the indigenous peoples in the interior (members of the Tupi-Guaraní family). French Guiana was not developed as extensively as its British and Dutch counterparts, due to periodic outbreaks of typhus, malaria, and yellow fever. Its swampy lowlands thus gained a reputation as one of the least healthy climates on Earth and attracted few settlers. Instead, the French government turned the area into one of its major sites for penal colonies, including the notorious Devil’s Island, just off the coast from Kourou, which was closed in 1945. The last penal settlement was closed in 1951. The population, mostly a mixture of French settlers, convicts, and ex-slaves, plus a few Indian and Chinese immigrants brought to work in the 19th century, became French citizens in 1848, was fully represented in the legislature from 1877, and became a full overseas department in 1946. Since 1946, there has been population growth from Hmong refugees from LAOS, and French continentals who have chosen to retire here. The latter form a strong minority group, whose political party, the National Front, continues to oppose any discussion toward independence, owing to the department’s heavy dependence on imports of food and energy from France.